Pools of green and red gathered around the pubs of Dublin 4 on Friday evening. Fans of all ages trooped towards the Aviva Stadium, most wearing half-and-half scarves bearing the crests of the Republic of Ireland and Liverpool FC. It was a chance to see their heroes, albeit a few years past their prime. Rush, Fowler, Dalglish, Keane, McAteer, Whelan, Aldridge, McManaman, Berger - household names still doing their thing at Lansdowne Road. A blue sky on a fresh, dry spring day, this should be what going the match feels like. It should never end in the despair Sean Cox and his family endured a year ago. The aftermath of that desperate night in Liverpool brought 26,873 people to the Aviva. A senseless and brutal attack left Sean with devastating injuries and cast him down a dark, challenging road. His spirit, and the relentless support of his family, has seen him make encouraging steps over the last 12 months though his appearance at the game took a major collective effort to ensure his comfort and safety. Sean's wife Martina had said this week that he'd "missed so many milestones". Nothing could keep him from missing this one. He's largely been confined The National Rehabilitation Hospital in Dún Laoghaire where he'll stay until June. After that he will look to try and enter a rehabilitation unit in the United Kingdom. There are no other rehab facilities in this country, and he will need care for the rest of his life, the cost of which will run into millions of euros. These occasions of course will help Sean's cause. There have been several initiatives already, including an official GoFundMe page which has raised over €1m to date, and a benefit game between Meath and Dublin at Pairc Tailteann before Christmas. Tonight, soccer-mad Sean was treated to two of his great sporting loves slugging it out in his native city. A throaty rendition of You'll Never Walk Alone swept around the ground as the players rambled out before a minute's applause was observed for 'The Anfield Iron' Tommy Smith, who passed away just hours before tonight's game. A minute's silence was then held to mark the upcoming 30th anniversary of the Hillsborough Disaster. After that, a carnival atmosphere descended on the Aviva. Jason McAteer performed his best piece of miming since he told Roy Keane to 'put it in his next book', doing the universal hand signal for a pair of glasses after the referee ruled the ball had trickled out of play. Then Robbie Keane took off on a mad, manic dribble that had the crowd on their feet before he blazed it towards the Dodder. A decent tempo continued with Robbie Fowler considering an acrobatic overhead kick before apparently remembering his age; a neat turn and fizzed drive that forced Wayne Henderson into a smart stop soon after showed the old technique remains though. Ronnie Whelan threw a mock tantrum when he got taken off after 15 minutes, Kenny Cunningham threw his body into tackles. And then, 22 minutes in, the biggest cheer of the night, as Sean Cox himself flashed up on the big screen, watching intently from his seat. All four corners of the ground stood to applause. The fans were lapping it up as chances flowed and both sides showed flashes of genuine quality. Keith Andrews broke the deadlock for Ireland on 26 minutes when he glanced a cross from the right past the big Dutchman Sander Westerveld. Cunningham then showed a bit of lead in the legs when he chopped down the sprightly Jermain Pennant in the box and up stepped Liverpool's John Aldridge - still doing that mid-run shuffle, still pulling it off - to slide home the penalty. The men on show may have slowed down in their advancing years but there were a few party tricks to engage the crowd. Andrews clipped the bar with an audacious 45-yarder early in the second half, before Vladimir Smicer showed a cool head to slip a cute finish past ex-Bohs man Shane Supple. Ireland boss Mick McCarthy responded by throwing on Niall Quinn and going direct. It's worked before... and it almost worked again, Quinn looping a header off the bar with his first touch. It finished 2-1 to the Reds, and the fans went home happy. This was an occasion to raise money and awareness for Sean Cox. Money to help him on his road to recovery; and the awareness that his journey does not end tonight. "We've seen the devastation the family have gone through," Jason McAteer told RTÉ Sport afterwards. "The crowd didn't let us down, the Irish people didn't let us down. "I got to see Sean before the game and it broke my heart. It could have happened to anyone, any one of us. It's like sliding doors isn't it? A minute later, ten minutes before. It doesn't stop here though. It's ongoing. Sean's recovery is something we'll always watch closely." 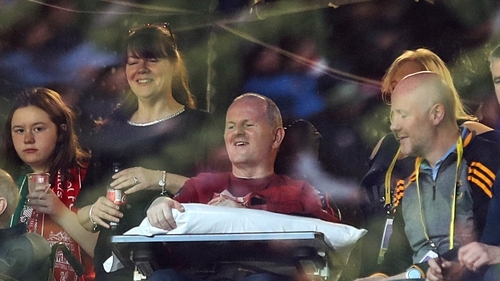 Sean Cox's courage is unbowed and defiance stronger than ever. He will never walk alone. Liverpool: Sander Westerveld, Jerzy Dudek, Glen Johnson, Patrik Berger, Steve McManaman, Vladimir Smicer, Salif Diao, Robbie Fowler, Ian Rush, Djibril Cisse, Neil Mellor.Played for both teams: Jason McAteer, Robbie Keane, Phil Babb, John Aldridge.